Our pack of photo booth props are a great way to take some fun, memorable pictures with your guests at your baby shower or gender reveal party! Each pack consists of 10 photo booth props. 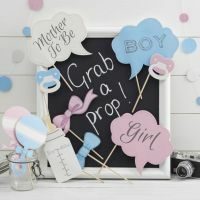 Other products in the Little Lady or Mini Mister range are available including tassel garland, bunting plus many more!